People around the country, including Fox News' Bill O'Reilly, are chipping in to help the father of a Marine killed in Iraq after a court ordered him to pay the anti-gay church he's been battling in court. 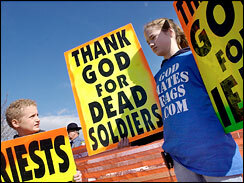 Albert Snyder of York, Pa., is suing the Westboro Baptist Church, whose members picketed the funeral of Snyder's son, Lance Cpl. Matthew Snyder. The Topeka, Kan.-based church contends that U.S. military deaths are God's punishment for tolerance of homosexuality. Meanwhile, an appeals court has ordered Snyder to pay $16,510 in appeal costs to Westboro founder Fred Phelps. Snyder tells The Baltimore Sun he's received about 3,000 e-mails from people who planned to contribute to the payment. The American Legion is also asking people to donate. However, thanks to a pledge by conservative Fox News anchor Bill O'Reilly, Snyder may not need to worry about the court-ordered fee. "That is an outrage, and I will pay Mr. Snyder's obligation," O'Reilly wrote in his blog Wednesday. "I am not going to let this injustice stand." The Fox commentator gave his full support to Snyder's ongoing court battles, saying he was "fighting a good fight". Snyder initially won a civil suit against the church and was awarded $11 million in damages for what the court deemed an intentional act by the Baptists' to inflict additional emotional distress upon his family. The Baltimore Sun reports that the compensation was reduced to $5 million on a first appeal, and then eventually scrapped, at which time Phelps sued for the costs of his appeal process. Attorneys said Tuesday that Snyder was struggling to come up with the court-ordered payout to Phelps' church, and fees associated with filing a brief with the U.S. Supreme Court. One of the thousands of people who have apparently rallied to Snyder's side via e-mail, was 72-year-old retiree Sally Giannini, who told The Sun, she was "appalled" by the case. "I believe in free speech, but this goes too far," Giannini, of Spokane, Washington, told the newspaper. The Supreme Court has agreed to consider whether the protesters' message is protected by the First Amendment or limited by the competing privacy and religious rights of the mourners.